Home > Biologico >Organic Fruit & Vegetable >Tuberi e Radici Bio >Organic Jerusalem artichokes (topinambour) " Almaverde Bio"
Organic Jerusalem artichokes (topinambour) " Almaverde Bio"
An extraordinary tuber low valued because of the look similar to the potato’s and the flavour that reminds of the French artichocke’s. It’s a mine of sugars and fibres that improves the digestion and its richness in vitamins fight viruses and reinforce the sight. The high content of inulin and the modest amount of starch place it as a good food for people with diabetes. It was used for its edible root, then it was supplanted by the potato. 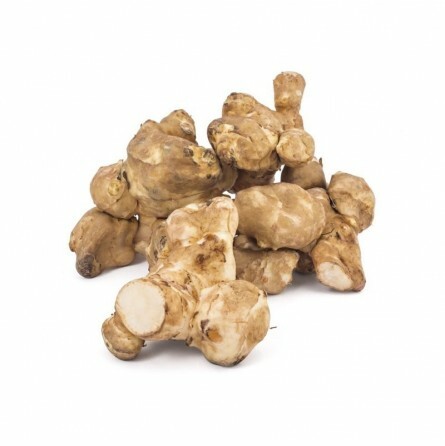 The tubers of Jerusalem artichoke (in Italy) are harvested in Autumn / Winter, they are very nutritious and the cooking is similar to the potatoes'. In the Piedmont's cuisine they are typical with Bagna Cauda and fondue. Thanks to the content of inulin, it is a plant very suitable and indicated for the diet of people with diabetes, as inulin functions as a reserve of carbohydrates (replacing starch) regardless of insulin. Inulin is composed of a chain of fructose molecules ending with glucose. Depending on the season of harvesting, the length of the molecules of inulin varies and therefore their solubility. The Jerusalem artichoke passes through the stomach and the first part of the intestine without being digested, only in the last part of the intestine there are the " bifid " bacteria and lactobacilli that are able to break the long molecules of the helianthus tuberosus, whose fibrous characteristic has a very positive effect on the bacterial flora. The tuber is also rich in mineral salts and in particular potassium, magnesium , phosphorus and iron as well as zinc and selenium . Caution: The information contained on fruttaweb.com are for information purposes only . For more information, please read the Disclaimer contained in the "Terms and conditions of use of fruttaweb.com ." The sautéed Jerusalem artichokes are an outline little known but original and tasty , they are very simple to prepare , only seasoned with olive oil, garlic, salt, pepper and parsley, have a distinctive flavor that will be appreciated by all. The sautéed Jerusalem artichokes are a perfect side dish to accompany meat or other vegetables, contain very few calories and are rich in inulin, soluble fiber that aids digestion . To prepare the sautéed artichokes, start with cleaning the Jerusalem artichoke tubers. First, rub your hands with lemon juice, because Jerusalem artichokes, like artichokes , tend to blacken and to leave the fingertips blacks . Also prepare a bowl of acidulated water ( with lemon juice) to dip once cleaned . With a boxcutter scrape the skin of Jerusalem artichoke to remove the dirt and the hardest parts . Wash them well and dip in water acidulated to prevent blackening. Drain and rinse the artichokes , cut into thin slices about 2 /3 mm , using a sharp knife or a mandolin and prepare a pan where scalderete the extra virgin olive oil and you will fry the garlic cloves chopped . Pour the Jerusalem artichokes in the pan. Add salt, mix to flavor and cook with the lid on for about 15 minutes , occasionally adding a ladle of broth to keep it from drying out too much. A few minutes after the end of cooking, add the chopped parsley, a good grinding of pepper and mix well. The Jerusalem artichokes should be cooked, but still quite crisp. Serve piping hot Jerusalem artichokes sautéed as a side dish with meat or other vegetables. The Jerusalem artichoke or Helianthus tuberosus is a plant belonging to the family of Compositae. In Tuscany and also in other Italian regions there are only two species of the genus Helianthus: the sunflower Helianthus annuus cultivated all over the world, and the Helianthus tuberosus originating from North America that blooms in late Summer. This plant is very vital, almost weed, it prefers moist plots and conquers lands close to watercourses.